Oh so that's what we're going with for the title of this section? Sigh... Mind you, I'll give you a biscuit if you can figure out what the banner graphic means. The kimono is the iconic garment of Japan and everyone tends to assume that it's a strictly Japanese item. 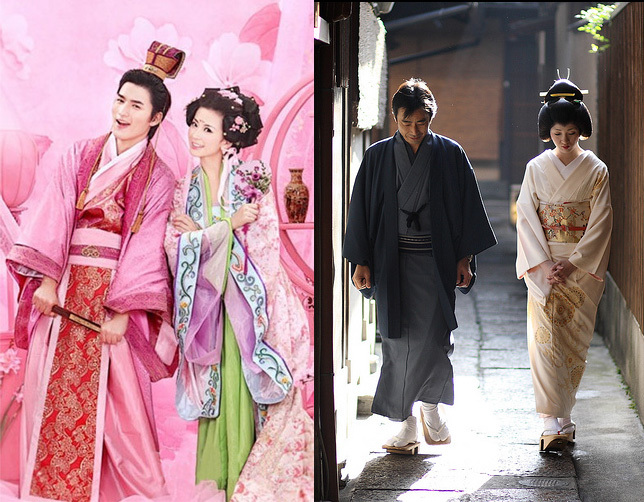 As I've mentioned before, the kimono is actually a development of the hanfu style of Chinese clothing. So how did the kimono come about? In the 5th century, Chinese clothing started to be adopted by some Japanese. Through Japanese embassies and delegations, many Chinese goods, including clothing began to become available in Japan. In the 8th century, Chinese clothing became quite fashionable among certain section of Japanese society and the overlapping collar especially so amongst women. Up until this time, Japanese people had worn separate upper and lower garments. 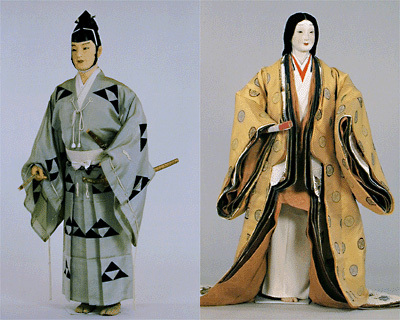 At the end of the 8th century, the Heian Period began and the kimono first appeared. Initially known as the gofuku (clothes of Wu - Wu being one of the Three Kingdoms in the period between the Han and Jin Chinese dynasties; if you've played Dynasty Warriors then you're on the right track), the kimono was a development of the hanfu style of Chinese clothing. Upper and lower garments were replaced by a single robe. This had a number of benefits, not least of which was that the wrap-around style meant that clothing didn't have to be made to fit an individual and thus allowed for a form of mass-production. Somewhat ironically, this generic production allowed certain artisans to craft elaborate robes without specific customers in mind. 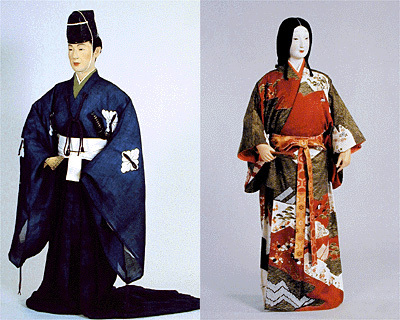 This was a period of great innovation and stylisation in Japanese clothing. 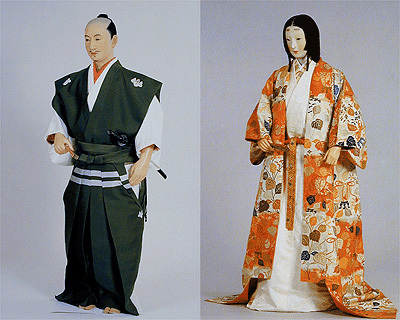 Kimono had several advantages over previous garments, not least of which was their adaptability for all seasons. In winter, kimono could be worn in layers to provide extra warmth, yet in summer kimono made of lightweight, breathable material kept the wearer cool and comfortable. In the picture above, the woman is wearing an example of a formal outfit as worn by noblewomen. Those of lower social station tended to wear just the kazami (the orange/pink outer layer in the picture). Note the kosode. That's the next development in the story of the kimono. The fundamental shape of Japanese clothes didn't change much during the Kamakura period, but colour and ornamentation became very important. Men and women both wore extremely colourful kimono. Warriors dressed in colours that represented their leaders and clans. 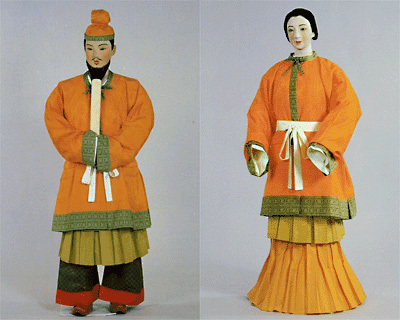 Note the white kosode under-layers in both the male and female outfits. During the Muromachi Period (1336 to 1573), the kosode (a single-layer kimono) which had previously been underwear, became outerwear. The kosode kimono had no fastenings as the hakama came up over the bottom of it and held it closed. So when the kosode became popular, a belt was needed and this was where the obi came in. 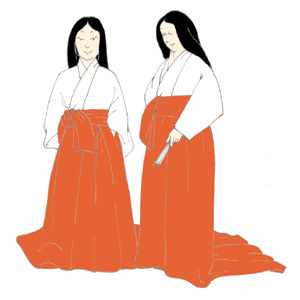 Although in the Muromachi period, the ornate uchikake (long coat like the orange one in the picture) was very popular, the obi was an essential part of Muromachi clothing. 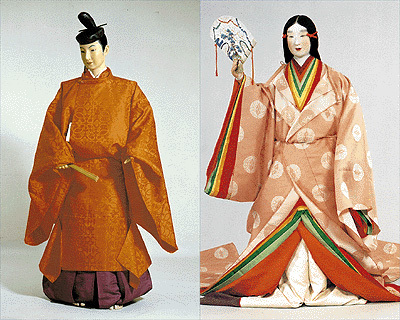 The long white kimono that the woman is wearing is what the kosode became and you can see the prominent obi on both the male and female outfits. Once the Edo period came around, the obi grew wider and more decorative, becoming an essential part of Japanese clothing. In the picture, you can see that the kimono is the same as those worn today. The obi is still quite narrow and features the dangling ends that were only really popular in the Muromachi period. As the Edo period went on, the ends of the obi became shorted and concealed. And that's the story of the kimono. It starts with the Chinese hanfu of the Three Kingdoms period and goes through a series of stylistic and practical changes through various historical periods ending up with the steady form which we see today. Many thanks to my wife for her assistance in the preparation of this article. Whilst she enjoys laughing at Korean and Japanese soap operas, she actually watches them purely out of her interest in the clothes. I wore Uchikake on wedding in Japan. It is only used for bride costume nowadays. I didn't know it from Muromachi era. Thank you for the interesting article! nice article..its a good read very educational too. Interesting post thanks for sharing, You describe very nicely about Chinese Clothing History. You're quite right about the Nara period clothing shown being Asuka. That was a mistake on my part. But to claim everything since is entirely Japanese is a bit of a stretch. Given that the Japanese wore two piece clothing prior to the introduction of Chinese fashions, the sudden switch to one piece was definitely influenced by Chinese styles. To deny that seems a little off. One piece flowing belted robes are indisputably Chinese. Hanfu and kimono do not look vastly different in that regard. And the alternative name for kimono, gofuku, inherently acknowledges that it is Chinese clothing (clothing of Wu). But that kimono are not an entirely Japanese invention doesn't detract from the authenticity of kimono. The very definition of hanfu is quite disputed. For the purists, it's Han dynasty clothing. For others, it's all traditional Chinese clothing. I used a picture of a more modern style of hanfu, rather than adhering to strict authenticity. Pretty much everything in Japan is directly influenced by China. It's almost impossible to discuss any Japanese tradition without acknowledging Chinese influence. Almost all Japanese traditions originated in China. So yeah, I agree with some of what you're saying, but to completely discount all Chinese influence beyond the Nara period is something that I would strongly dispute. I doubt you'll find many people who'd agree with you on that point. Certainly every book and academic work I've seen on the subject acknowledges the continual influence of Chinese fashions. I should maybe have gone into more detail, but I wasn't writing a book.